Home Numerology Angel Number Meanings Triple Digit Angel Numbers Meanings Angel Number 711 Meanings – Why Are You Seeing 711? Some days seem stranger than others. You wake up shortly before your alarm clock and see that it is 7:11am. You grab a coffee and a muffin on the way to work, and the total comes to $7.11. Sitting on the train, the phone number on the advertisement on the back of the seat in front of you ends in the number 711. When you arrive in the office and look over your emails, you have been assigned a new project with the code 711. Why is this number appearing everywhere you turn? Maybe Angels are trying to send you a message. What could the triple digit Angel Number 711 be trying to tell you? What does Angel Number 711 mean for love? Angel Number 711 starts with the number 7, which is linked with the spiritual and esoteric. It is symbolic of hidden knowledge, and intuitive knowledge that we do not always understand. The number 7 is also linked with the journey of gaining knowledge and often shows up in connection with a course of study or some important life experience. Next is the number 1, which is the number of new beginnings and new opportunities, and also of the creational forces both of the universe, and that we hold within ourselves. It is a reminder that we have the power and the responsibility to shape our own world. 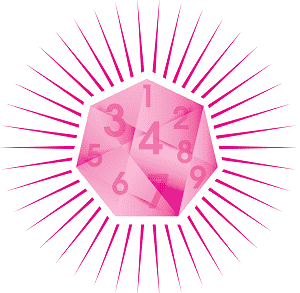 Doubled, the number 1 forms the Master Number 11, which is the most intuitive of all numbers. Angel Number 711 is also linked with the number 9, as 7+1+1=9. This is the number of endings and completions, which are often also beginning. 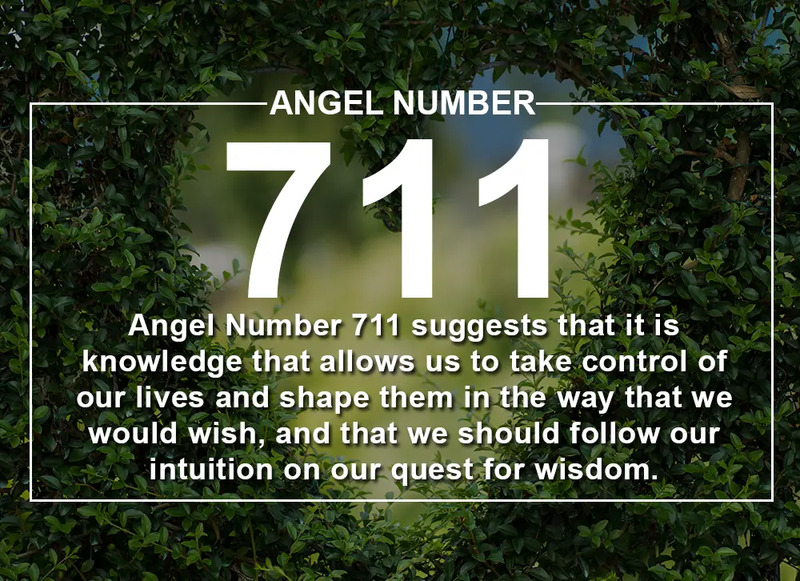 Angel Number 711 suggests that it is knowledge that allows us to take control of our lives and shape them in the way that we would wish, and that we should follow our intuition on our quest for wisdom. Sometimes we feel like we have lost inspiration, or like we have reached a plateau and that we are no longer moving forward. When we feel this way, Angel Number 711 can appear to tell us that we do not need to stay in this place. Now is the time to invest in ourselves and our own personal growth. This will reinvigorate us and rocket us forward on our path. If you have been thinking about going back to school, do it. Have you had your heart set on a life changing trip? Plan it. If you have been thinking about investing your time in learning something new, but felt it was a bit silly, don’t be shy, jump in. Often when we are presented with an opportunity, our instinct can be to jump in head first and worry about the consequences and what it might mean for the rest of our lives later. Angel Number 711 can be shown to us when such an opportunity is before us. It says jump by all means if this opportunity appeals, but keep your eyes open for rocks. It suggests this opportunity carries costs, costs that you can manage, but do not ignore them. We all want to lead extraordinary lives, but often the challenge is knowing what shape we want our extraordinary life to take. If we do not know where we want to go, how can we take steps to get there. Rather than all our steps taking us in the direction that we need to go, our steps can lead us in circles and keep us in the same spot. Angel Number 711 says stop and make a plan. Visualise and take the time to really understand what you want in life. Only then can you create the extraordinary life that you crave. Knowledge is power, and it is important to have all the information that you need before making an important decision. But sometimes we use the pretext of information gathering as an excuse to procrastinate. The 711 Angel Number can be revealed to us when the time to gather data is over. Now is the time to make a decision. If you leave it too much longer, you may find that your options have narrowed. Use the information that you have, and your intuition, to take you in the right direction. 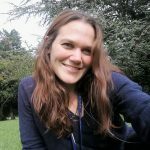 Sometimes when we come to the end of an important experience, like a course of study, or a professional development course, or even an inspiring trip, we can feel a little sad that this period of growth is over. We may also feel over confident, like we now know everything that we need to know. Angel Number 711 tells us that this is not the end, only the beginning. As we take our new knowledge into the wider world, we will find that it is a building block that will help us continue to learn and grow. We will also quickly realise that we still have an awful lot to learn. 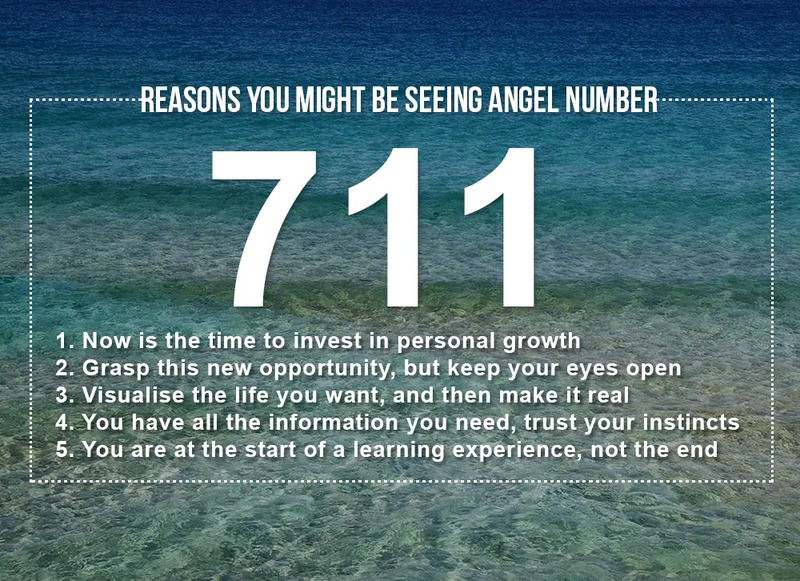 Angel Number 711 is generally a positive sign when it comes to love, as it usually means that something new is on the horizon. Even if we have recently broken up with someone, it promises that this is to make room for something better. However, it also tells us that we cannot wait for what we want to just appear. If we want someone new in our lives or we want to take our relationship to the next level, we need to take action to make it happen. But we do not need to jump in and put everything on the line. Use your intuition to read the situation and send signals that will nudge things in the right direction. Whenever you see an Angel Number, you should feel reassured that you are on the right path. Seeing any Angel Number means that the Angels are behind you and supporting you. Of course, you still need to decipher the specific message that this complex number has for you. Take note of what you were doing or thinking around the time that the Angel Number appeared. Angels will always reveal their numbers in moments when your particular challenge is at the front of your mind. Do you seek guidance and insights into the past, present and future, with regards to relationships, love, or money? 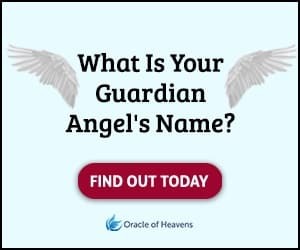 If you are frequently seeing the 711 Angel Number, take this popular free test to see whether your Guardian Angel is trying to send you an urgent message. Keep seeing 711 everywhere? Angel Number 711 is generally a positive sign when it comes to love. Learn the important meanings here!